Ginseng and Pomegranate Foam Cleanser is produced by the Ukrainian cosmetic company Elfa for its Dr. Sante 0% series. It is designed to delicately cleanse the skin and remove make-up residue. The product does not cause skin dryness. It is suitable for all hair types and can be used daily. Dermatologically tested hypoallergenic formula. Enriched with natural plant extracts, panthenol and allantoin. 0% foam cleanser is designed to take daily care of your skin. It has a light, airy texture that makes the foam very pleasant to use. The product cleanses your skin gently yet effectively without drying it out. It has a moisturising effect and prevents flaky skin. The cleanser contains ginseng extract that prevents premature skin ageing and stimulates epidermal cell metabolism. Pomegranate extract nourishes your skin and improves its elasticity. The product also contains lemon balm extract that has anti-inflammatory and refreshing properties. Panthenol moisturises your skin and allantoin makes it softer. 0% silicones, mineral oils, petroleum jelly, parabens, colourants, fragrances. Directions. Apply onto wet skin of the face and neck. Lather, rinse. Ingredients. Aqua, PEG-7 Glyceryl Cocoate, Lauryl Glucose Carboxylate, Lauryl Glucoside, Poloxamer 184, Cocamidopropyl Betaine, Glycerin, Polyquaternium-10, Panthenol, Allantoin, Panax Ginseng Root Extract, Punica Granatum Extract, Melissa Officinalis Leaf Extract, Citric Acid, Diazolidinyl Urea, Sodium Benzoate, Potassium Sorbate. Want to buy Ginseng & Pomegranate Foam Cleanser? Call us or submit your order via our web site! 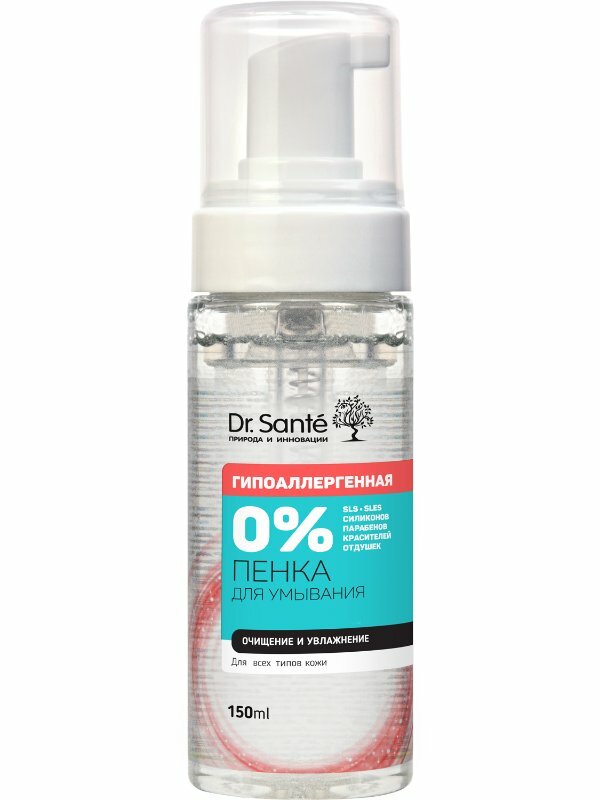 Dr. Sante 0% is a new series of natural cosmetics that embodies the result of the years of research carried out by the specialists of Elfa Laboratories, a member of the group of companies Elfa (Ukraine, Poland). The series combines innovative formulae and time-tested natural plant ingredients which provides effective and safe care. It includes hair, skin and body products for all hair and skin types and is suitable for highly sensitive and allergy-prone skin. Elfa Pharm produces Dr. Sante 0% in accordance with modern principles of the production of natural and organic cosmetics. This means, for instance, that Dr. Sante 0% cosmetics are free of potentially harmful ingredients such as SLES or SLS (sodium laureth sulfate or sodium lauryl sulfate), propylene glycol, mineral oils, petroleum jelly, silicones, parabens, synthetic colourants and fragrances. All Dr. Sante 0% products are based on hypoallergenic formulae with natural plant ingredients such as vegetable oils and herbal extracts. They take gentle care of your skin and hair and do not cause irritation or inflammation. All products have been dermatologically tested by reputable Polish and Ukrainian specialists and are completely safe, which is confirmed by quality certificates.